Williams (ribs) is getting cut by the 49ers, Tom Pelissero of NFL.com reports. Analysis: Though he's reportedly making progress with his rib injury, Williams missed out on his chance to push for a spot on the 53-man roster. Coach Kyle Shanahan famously lobbied for the Niners to select Williams in the fourth round of last year's draft, but undrafted free agent Matt Breida (shoulder) turned out to be the team's rookie gem in the backfield. It won't be too surprising if Williams draws some interest around the league. 49ers coach Kyle Shanahan said Williams suffered a rib fracture that will sideline him for "a while," ESPN's Nick Wagoner reports. Head coach Kyle Shanahan revealed that Williams sustained a rib fracture in Saturday's preseason loss to Houston and will miss the beginning of the regular season, ESPN's Nick Wagoner reports. Analysis: The injury comes at a tough time for Williams, who was in the thick of a competition to win a backup role with the 49ers this year after spending his entire rookie season on IR. The team hasn't decided whether they will place Williams on IR, but the early out designation for Week 1 is not a promising sign. Either way, Williams' health may ultimately decide his fate for the second consecutive preseason. Williams carried the ball eight times for 18 yards Saturday, adding a pair of receptions for another 14 yards in a preseason loss to Houston. Williams carried the ball 11 times for 27 yards and a touchdown in Thursday's preseason win over Dallas. He also secured two of three targets for 15 yards. Analysis: Williams didn't have a strong game from a yards-per-carry standpoint, but he has received positive reviews in camp for an improved work ethic following a disappointing rookie season. The 24-year-old has been competing with Raheem Mostert for No. 3 on the 49ers' depth chart, but Matt Breida's shoulder injury could turn it into a battle for the primary backup role if the latter is forced to miss extended time. San Francisco coach Kyle Shanahan said Williams looks much better than he did last season, Matt Maiocco of NBC Sports Bay Area reports. "I think [Williams] has a different mindset - understands a little bit more the standard of the NFL and difference," Shanahan said Tuesday. "Joe's come a long way. I think his body looks a lot better than it did last year. He put on a lot of muscle mass and he took advantage of the year of not playing." 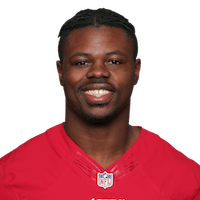 Head coach Kyle Shanahan said that Williams will have to "beat guys out" in order to maintain a spot on the 49ers' 53-man roster this upcoming season, Matt Maiocco of NBC Sports Bay Area reports. Williams (ankle) would be healthy enough to play if the 49ers hadn't already made the decision to hold him out for the season, Nick Wagoner of ESPN.com reports. There are no videos available for Joe Williams. Click here to view all videos.